Aragon pattern kitchen knives with carbon steel (rustable) blades and full tang beechwood handles. Perhaps a more typical chef's form than the classic Solsona knives, these too make excellent general purpose food preparation slicing and chopping tools. 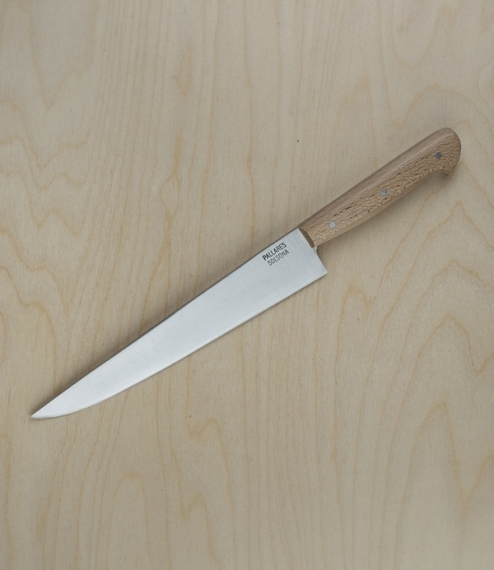 Hand produced in Catalonia at the workshops of Cuchillería Pallarès the one surviving knife and tool maker in a town once dotted with small manufacturers. Now with a workforce of 15 the management still split their time between administrative necessity and manual craft production. 20cm blade. By purchasing this item you are confirming that you are over 18, and that we may contact you prior to dispatch in order to verify this.